This year members will have three (3) ways to vote for their board of directors during the 2018 election. In addition to voting in person at the scheduled annual meeting in your community, members will be able to vote online or by mail in ballot. 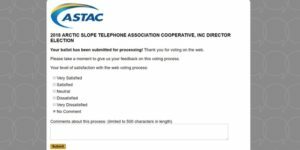 To place an electronic vote, login to your ASTAC SmartHub online account and double-click the yellow “Vote Now” icon next to the “Pay Now” icon. 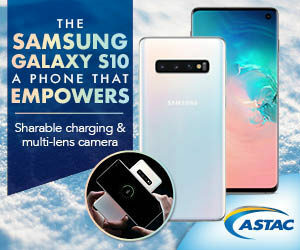 If you do not have an ASTAC SmartHub account contact our Customer Service Department at 1-800-478-6409 and a representative can establish one for you. Once activated, double-click on the “Vote Now” icon in the upper right corner of your SmartHub home page and follow the steps below. Voting will be open between June 11, until 11:59pm on June 29, 2018. 2. Double-click the ‘Vote Now’ button. 3. The ‘DirectVote’ welcome page displays. 4. Click the ‘Go to Ballot’ button. 5. The ‘Web Ballot’ page displays. This is where you can view the candidates. 6. Select the candidate you wish to vote for. 7. Click the ‘Go to Ballot Confirmation’ button at the bottom of the screen. 8. The voter summary page displays the candidate you selected. 9. There are options to either click ‘Change Vote’ which will navigate back to the ballot page, or click the ‘Submit Ballot’ button to finalize the voting process. 10. You may want to print the summary page for your records. Once the vote is submitted, you will not have access to the ballot again. 11. A confirmation email will be sent to the email address on file. If an email is not on file, a page will display providing the option to add an email and send a confirmation. 12. After the ballot is submitted, the webpage will redirect to an optional voter satisfaction page. 13. Please rate the voting process and leave a comment. 14. After the survey is submitted, the webpage redirects to the ‘End Session’ page. 15. Click the ‘End Session’ button. 16. 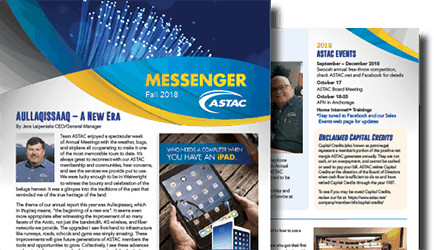 The webpage redirects to ASTAC’s website. This is confirmation the online voting process is complete. Official ballots were mailed on June 11, 2018. Use the perforation to tear off your official ballot. Cast your vote for your district. Sign and date the bottom of your ballot or it cannot be counted. Place your signed official ballot in the postage-paid envelope. Mail in ballots must be received by Friday, June 29, 2018. Members may also vote in person at their community’s annual meeting held between July 9-13, 2018. To ensure one vote per membership our third-party vendor, Survey & Ballot Systems, will be overseeing the board vote count. If a member accidentally votes in more than one form the first vote received will be counted as your first and final vote. At each stage of the voting process there will be a verification process to ensure that a member has not already cast a vote.